Workers World Party 2016 vice-presidential candidate Lamont Lilly speaking in Roanoke, Virginia. Community members from throughout southwest Virginia packed a meeting room at the Gainsboro Library in Roanoke Feb. 11 to hear Lamont Lilly discuss the history of Black Liberation and building people’s power today. 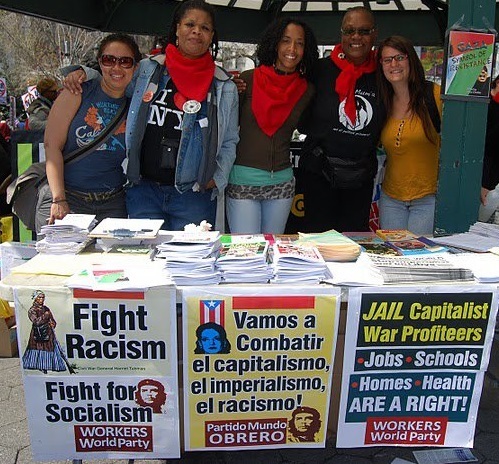 Lilly was the 2016 Workers World Party Vice Presidential candidate. The Black History Month event was sponsored by 15 Now Roanoke and WWP. Lilly, a resident of Durham, N.C., gave a sweeping view of Black history from Ida B. Wells and Carter G. Woodson to Ella Baker, the Black Panthers and Black Lives Matter. 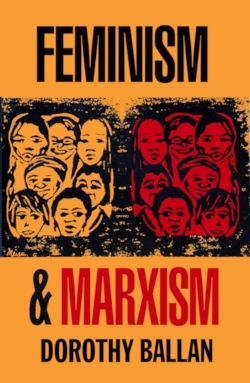 Lilly concluded his remarks in the tradition of such Black socialists as Paul Robeson, Dr. W.E.B. Dubois, Claudia Jones and Abayomi Azikiwe by denouncing the capitalist system and calling for a socialist revolution to truly free people of African descent and all working-class and oppressed peoples internationally from the horrors of capitalism and imperialism. Before Lilly spoke, artist Corissa Morrison opened the event with a fightback song. Then community activist, artist, mother and educator Bernadette Brown, along with Jordan Bell, gave presentations on the historical and present struggles of the Black community in Roanoke. The Gainsboro Library is situated in an area that was once known as “Black Wall Street” before it was largely, but not completely, destroyed by the building of Interstate 581. The presenters shared the rich history of struggle of people of African descent in the Roanoke area, including ongoing and protracted resistance during slavery, “legal” segregation, sharecropping, domestic work and the railroads to the present day where most African Americans are unemployed or work one or several low-wage jobs for non-union pay. 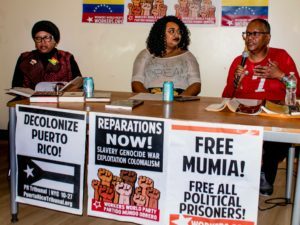 After the presentations, the standing-room-only crowd of all ages, nationalities, sexual orientations, students and majority women joined in lively discussion about how to move the people’s struggle forward in this era of the Trump administration. Black workers informed white workers how they could assist oppressed people’s liberation and how all workers’ liberation depended on this. Other participants saluted the resistance against Trump’s Muslim ban and other attacks on the people. A variety of community members testified to the atrocities being inflicted on them by the police. They told how they are being robbed by capitalists and their political servants and suggested methods of how to fight back. 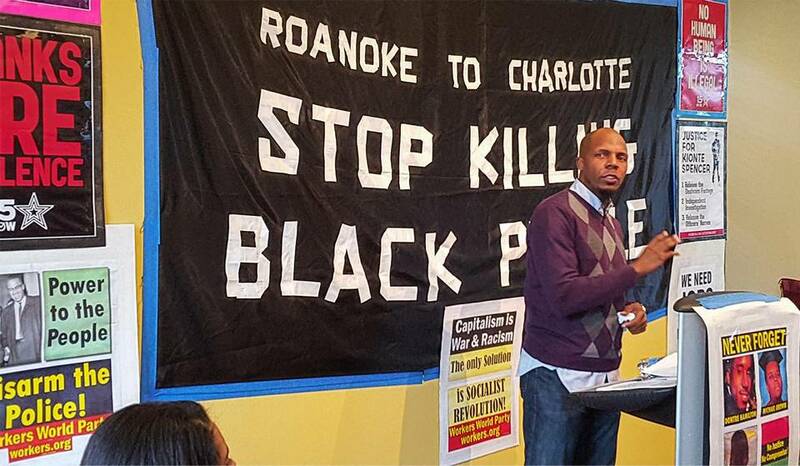 Carl Spencer, Kionte Spencer’s brother, attended the meeting, and more support was gathered to demand justice for Kionte, who was murdered by Roanoke County cops Feb. 26, 2016. The Feb. 11 event was collectively organized by many in southwest Virginia. It was part of a series of people’s events in the area over the past weeks. Thousands in many cities have come out to protest Trump, support women and LGBTQ people, denounce the Muslim ban and deportations, and much more. A variety of people’s protest events, organizing workshops and network building are in the planning stages. For photo and videos of Feb. 11 event and more information on upcoming people’s events in southwest Virginia: facebook.com/15NowRoanoke.